I’d like to provide an update on “Operation Sellout.” It’s going very well. I have achieved a major goal of mine: Being a Background Person. Check that right off the list. 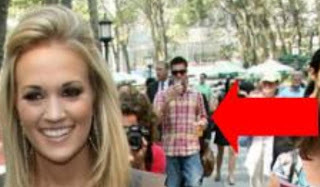 About a month ago I was walking around Bryant Park in NYC during Fashion Week and was hot on Carrie Underwood’s trail. The paparazzi started to swarm and I knew that this was my chance to become “a background person.” Well there I am! A background person. These photos were actually posted over at ImNotObsessed just the other day. The girl I was with that day was reading another site (sacrilegious) and she spotted me! Brilliant! I’m hoping that US Weekly starts a new segment called, “Background People, They’re Just Like Us!” I’ll start. I’m a background person, I’m just like you! I stalk celebrities with my camera phone in one hand and my coffee in the other. I’m just like you, I clearly dress like a lumberjack. I’m just like you, I’m an idiot. See? That was easy. See you in the pages of Us Weekly! Special Note to the following people: The Olsen Sluts, Dina Lohan, Tyra Banks, Jennifer Aniston. If you see that face (in the photo above) coming towards you while walking the streets of NYC, do me a favor, just let me put you in a headlock and let’s call it a day. Don’t make me have to chase you. Thanks, in advance, for your cooperation. Operation Sellout Update: London. Check! IBBB Running the Boston Marathon?